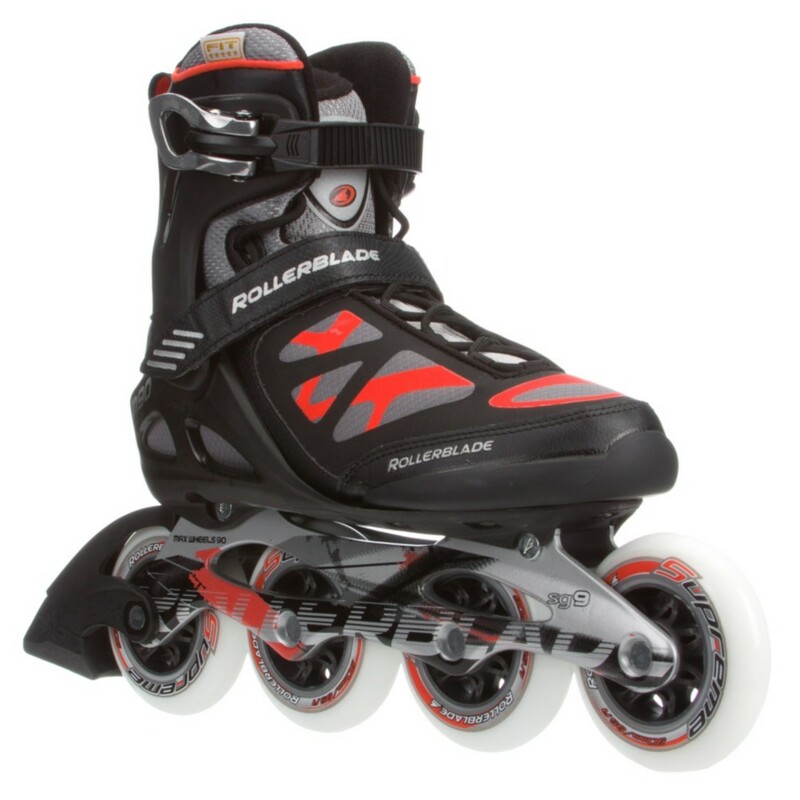 Stephen Charrier, President of Rollerblade USA, and Rob Gill, of InlineSkates.com, review the 2015 Rollerblade Macroblade 90 ALU Mens and Womens Inline Skates. Hey, welcome to the Daily Spin. I'm Rob from inlineskates.com joined today by Steven Cherrier - president of Rollerblade. Steven, thanks for being here. Thanks for having me. We are talking about an incredible skate in the Rollerblade lineup - the Macroblade 90. This is the women's model, you have the men's model in your lap. Really phenomenal skate in Rollerblade's lineup. Yeah, this is maybe one of my favorite skates we make, or have made. It's a, the 90 in the name refers to the wheel size so 90mm wheels moving up from a Macroblade 84 in the line. Yeah, so, Rob, you step up into the Macroblade 90 and this is a pretty substantial skate right here. For sure. At this price-point, this is the best skate we've ever made at this price where it sells. 90mm wheels give you speed, give you a lot more torque and power and it rolls over obstacles really well too so that rough part of the pavement, these wheels just roll right over it. For sure, and then coupling that with an SG9 bearing now, such a smooth glide and increasing that top end speed on the skate. Absolutely. So, your frame gets a little bit longer because of the 90mm wheels - this skate's going to give you a really nice long stride and, you know, we couple that with a Macroblade fit up above and probably like I said, the best balanced, best skating products we've ever made is the Macroblade family and the Macroblade 90 is the perfect, perfect balance in there. For sure, and you talk about fit, let's talk for a second about the men's fit and a women's fit in this skate. Yeah, there is a difference. Both skates come with a Form Fit Liner on it. Our new liner has a really nice fit to it but the women's skate is specifically built for a woman's foot. It's going to have a lower calf muscle to it, a higher instep and a narrower heel. This skate also puts her, a woman, in a slightly more forward position. properly positioned biomechanically to skate. For sure, and then this skate also available in full and half sizes so really making sure you're getting the right fit in a performance skate. Another really important feature too is the 90mm, it's a Supreme wheel so this is a high rebound, higher performance wheel we step up to in this product and it makes a huge difference in speed and performance. For sure. So, now in the Macroblade 90, who is this skate for? It's for, again, an athletic person who is going out and getting started skating could skate on a Macroblade 90. But if you're an athlete, a runner who wants to start skating as part of your training routine, this is the perfect skate for that, for putting down some distance and some miles and some real skating. For sure, really incredible skate in the Rollerblade lineup - the Macroblade 90. Thanks for joining us on the Daily Spin and you can check it out on inlineskates.com.